We've had several discussions lately about movies based on real-life events or biographies (probably because it seems that every movie nominated for a major award falls into those categories) and the pros and cons which go along with those projects. Something which we rarely talk about are autobiographical films. We've all been told to "write what you know", so it's not uncommon for a filmmaker to sprinkle elements of their lives into a movie, but it's rare to watch a film and think, "Oh yeah, this is just a fictionalized version of them." We've seen directors like Woody Allen, Terrence Malick, and Francois Truffaut do this, and now we can apparently add Chris Rock to that list, as one can't watch Top Five and not get a sense of reality from it. Rock stars in Top Five as Andre Allen, an entertainer who has entered a cross-roads in his career. Once a popular stand-up comic, Allen found fame and fortune in a series of films where he played "Hammy the Bear", a large bear (costume) who was a police officer. Allen is trying to put that image behind him by appearing in a film about a slave uprising in Haiti. He's also engaged to marry reality show star Erica Long (Gabrielle Union) in a ceremony which is to be televised. As Allen is in New York doing publicity for his new movie, he's informed that he will be accompanied by a reporter from the The New York Times. Thus, he meets Chelsea Brown (Rosario Dawson), a journalist who is not star-struck by Allen and doesn't hesitate to ask him about his sobriety and the authenticity of his pending nuptials. At first, Allen is angered by this approach, but as the day wears on, her questions make him examine his life. Hmmm, let's see here: Grew up in the projects in New York City? Check. Started out as a stand-up comedian? Check. Was part of a successful franchise where he played an animal? (Madagascar) Check. There are certainly some strong similarities between Chris Rock and Andre Allen. Obviously, Rock isn't married to a reality star, but he did recently file for divorce, which could have altered his view of marriage. And I don't think that the alcoholism storyline applies to Rock, but he did reportedly have a brother who was an alcoholic. So, the story here isn't necessarily ripped from the headlines, but one can't watch the movie without connecting the dots with the similarities. As far as the parallels between Rock and Allen's careers, it's been some time since Rock has had a stand-up special and his most recent successes as the box-office have been part of an ensemble, such as the Grown Ups films. So, it's probably not a huge leap to assume that Rock wrote and directed Top Five as a way to get back to his roots. And he's certainly successful in the sense that the movie is filled with the kind of raw, in-your-face comedy which made Rock famous in the first place. As a pampered star, Allen says whatever is on his mind, and this leads to some truly funny lines, which vacillate between truly crude and very clever. The most talked about scene in the film will most likely be one which contains several past and current cast members from Saturday Night Live, including a few who weren't prominent players on the show when the movie was shot. The third act features another scene with some familiar faces (I won't spoil it) and probably the funniest line in the movie. As with Scott Foley in the recently reviewed Let's Kill Ward's Wife, Rock has surrounded himself with friends to make a movie, but the results are much more satisfying here. The only knock against Top Five is that, not unlike Andre Allen, Rock has tried to make things too serious here at times. The alcoholism, his relationship, and the state of his career may come across as realistic, but they also don't always gel with some of the silly comedy featured in the film. Rock has also woven a Cinderella theme into the story which leaves some it quite predictable. Also, this isn't the most original story ever told, as the whole interview angle/"A reporter gets under the skin of a celebrity" has been done before, as in movies like Interview (of all things). Those hiccups aside, Top Five is an entertaining and funny movie which is somewhat of a return to form for Rock. It's been years since I've laughed like this at something that Chris Rock has done and let's hope that it's a sign of things to come. Top Five spends too much time focusing on rap on Blu-ray Disc courtesy of Paramount Home Entertainment. The film has been letterboxed at 2.35:1 and the Disc contains an AVC 1080p HD transfer which runs at an average of 33 Mbps. The image is very sharp and clear, showing no overt grain and no defects from the source materials. The colors look very good and the picture is never overly dark or bright. The picture is somewhat soft in some scenes, but the depth is nice, most notably in the sidewalk scenes. The Disc carries a DTS-HD Master Audio 5.1 track which runs at 48 kHz and an average of 4.0 Mbps. The track provides clear dialogue and sound effects. The music in the film provides some very strong subwoofer effects, which come of out nowhere in certain scenes. The stereo and surround effects are nicely done in the street and nightclub scenes, and we can pick out individual sounds from the rear speakers in a few scenes. The Top Five Blu-ray Disc contains a selection of extra features. We begin with an AUDIO COMMENTARY from Chris Rock and JB Smoove. 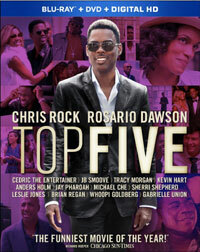 "It's Never Just a Movie: Chris Rock and Top Five" (20 minutes) is a profile of Rock and draws parallels between the film and Rock's own life and career, specifically his stand-up. "The Making of Top Five" (10 minutes) takes us behind the scenes to show Rock and the cast & crew at work. We get comments from Rock discussing the origins of the film, while we also see him working with the other actors on the set. "Top Five Andre Allen Standup Outtakes" (6 minutes) shows us extra footage from the character's comedy routine from the film. "Top Five Moments You Didn't See in the Film" (4 minutes) are presumably deleted scenes, but they have the feel of something from an outtakes reel. The Disc does contain three DELETED SCENES which run about 4 minutes.